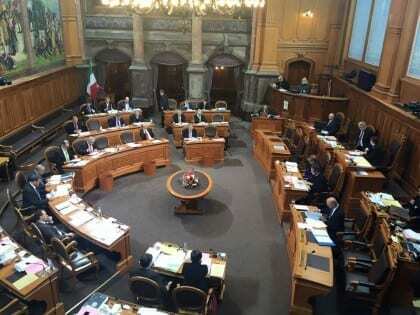 On December 17, the Council of States, the upper house of the Swiss parliament, unanimously approved a motion calling for people to vote against a universal basic income (UBI) in the national referendum to be held next year. On October 2013, the Popular Initiative for a UBI collected 126,000 signatures. This was enough to gain the right to hold a national referendum. Before the referendum is held, the two houses of parliament can issue recommendations for people to vote in favor or against. On September 23 this year, the National Council, the lower house of parliament, had also recommended to vote against UBI. While the date has not been set yet, the national referendum is expected to take place next year. There are indications that this might be in June 2016. Although nobody voted in favour of the UBI, some of the interventions by MPs and government Ministers were not dismissive of the idea. Enno Schmidt, co-initiator of the Swiss popular initiative, heard the debate in the Council of States, and noted down some of the more positive statements for Basic Income News. The idea of a UBI is noble and it would be important to think ahead. But there are too many open questions and uncertainties about its introduction. The current social security system relies on the logic of insurance. A UBI is based on the logic of existence. A basic income would be a sign of appreciation to all those who make their contribution to society, but are not counted in the Gross Domestic Product. Half of all work carried out by people is not financially rewarded and therefore less visible, but is crucial for the functioning of our society. We cannot rely solely on women for these activities. That era is over. Today we are living with a market model that offers a rational and selfish image of humanity. A vision that privileges more freedom and independence would help us give more importance to trust, compassion and cooperation, rather than confrontation and competition. Today only a few can imagine a UBI, but tomorrow technology will make a lot more jobs redundant. After that, we will have to think about the feasibility of a basic income. The greatest ideas in history were always put forward by a small group of people, and met with fierce opposition for many years, until they suddenly found the support of the majority. The idea to grant a personal income to all citizens unconditionally and for life is simple and fair. It is a project that is socially liberal and focused on the talents of each person. It is neither left nor right, it is about core societal values. Ideals move the world. But unfortunately, we, the politicians, are driven by populism and fears. We do not allow room for utopias. Both Fetz and Pasquier abstained in the vote. Basic Income News is grateful to Enno Schmidt for the additional reporting. An interview with him on the Council of States’ motion will be published in our website shortly. Matthias Lindemer, “Swiss politicians reject basic income because they are scared of humans,” Basic Income News, December 7, 2015. Stanislas Jourdan, “SWITZERLAND: Parliament rejects basic income initiative, but poll shows popular support,” Basic Income News, October 3, 2015. Toru Yamamori, “Interview with Enno Schmidt, co-initiator of the Swiss Citizens’ Initiative,” Basic Income News, September 19, 2015. Jenna van Draanen, “SWITZERLAND: Swiss parliamentary committee on social affairs opposes a federal initiative for basic income,” Basic Income News, July 14, 2015. Karl Widerquist, “SWITZERLAND: National referendum will be held on basic income,” Basic Income News, October 5, 2013. Urgency? Why will it bite them? Any radical changes always find opposition by the majority who live more by routine than conscious choices. However a NY university did a research stating all social changes have a threshold of only 10% of the population with a definite intent to apply an idea, for it to start the process of change in the rest of society. As long as capital has a priority over people in a society, socio-economic imbalances and dislocations will be a feature of the economy. Perhaps for the Basic Income idea to work, all the human resources of the productive sector of the economy, including the entrepreneurs will have to produce using the cooperative principle. Unless everyone owns his/her own job, the investors will always choose the most profitable outcomes over and above the needs of the people producing the wealth. In case it has to be clarified…. CAPITAL DOES NOT PRODUCE WEALTH….. PEOPLE DOES.